Dorna recently confirmed that an agreement had been reached for both MotoGP and WorldSBK to race at a to-be-built street-style circuit in the Mandalika tourist region on the island of Lombok, near Bali, from 2021. After so many false dawns since Indonesia last hosted a motorcycle grand prix, at Sentul in 1997, backing from state-owned enterprises and a recent reception with the president has provided reassurance that the Mandalika venue is finally the real deal. But the words 'street-circuit' and 'MotoGP' raised eyebrows, many envisaging 220mph motorcycles being sent out on a barrier-lined Monaco-style F1 track. Such 'scepticism' was directly addressed by Mark Hughes of MRK1 Consulting which, along with RoadGrip Motorsport, has been appointed by the Indonesian Tourism Development Corporation (IDTC) to plan, implement and run the new circuit. "We are very conscious that when we announced this project there was a reasonable amount of scepticism about the concept of a street circuit," Hughes said, during a presentation of the project at the season-opening Qatar Grand Prix. "We have to make very clear that the track has been designed and will be built to the appropriate FIM safety standards for MotoGP." Dorna CEO Carmelo Ezpeleta also made clear that safety would not be compromised. "We've always said that we don't race in a street circuit, but this has all the facilities of a street circuit - in a middle of a 'city', all the hotels will be there - but with full security [safety] for the riders," declared Ezpeleta. In other words, it'll basically be a permanent circuit (with all of the normal run-off) but handed over for use by public vehicles during the rest of the year, hence the slightly deceptive 'street' tag. 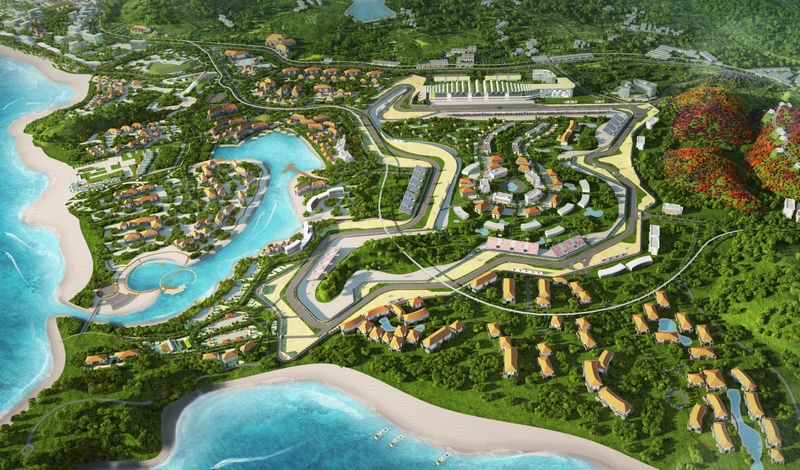 In terms of the actual layout, much of the circuit was determined by road plans already in place for the Mandalika resort. "The master plan for the resort [layout] was actually finished before we got involved. And then between Roadgrip, MRK1 and ITDC we've tweaked that track design," Hughes said. "We knew we couldn't go in and entirely change it, there had already been too much invested in that, and with the support of Dorna and also the FIM we then made some small changes to accommodate the safety requirements for a Grade A license. "When you arrive for the race event it will be like arriving at any other MotoGP track. It will have all the infrastructure there," Hughes added. "But a large percentage of that infrastructure would then come out in order to turn the track back into a road network for the resort for the rest of the year. "I think that's very important for Indonesia, Indonesia is such a widespread country that having a permanent circuit in Indonesia in one place didn't necessarily make sense. But this is great use of the Mandalika resort. "For example, we will have a fantastic pit building which will double up as a conference and exhibition centre so it will have use outside of the race event and forms part of the infrastructure for the tourism destination." Some MotoGP circuits have suffered asphalt damage due to use by other championships, most notably bumps in the braking zones caused by F1 cars. But a permanent course is still a carefully controlled environment compared with the wide range of vehicles allowed on a public road. "One of the core business elements for our partners Roadgrip is maintaining road surfaces, airport runways and they have a very comprehensive technical department that looks after the specifications of asphalt," Hughes explained. "We will have standard operating procedures in place limiting the type of traffic that can use those [circuit] roads throughout the year to minimise the amount of damage, risk of contamination, and we also have some very specialist equipment to maintain the grip levels of the circuit. "So we can actually measure the friction of the circuit when it's brand new and we can then maintain that for every race. There's a lot of science behind that. I don't necessarily understand it, but we've taken care of that." While solutions are in place to maintain the quality of the asphalt, others have expressed concerns over the track layout, which appears to consist largely of slow corners. Ezpeleta cautioned against drawing any conclusions based on a map alone. "In our experience, it's not possible to look at a layout just on paper and say if it's capable of [being a good layout] or not. "We think the construction company is doing very well, we see and we are talking with Franco [Uncini] and the rest of the people at the FIM and our opinion is that the race track will be okay. "If it's nice [to ride] or not? To be honest we'd get different opinions [from the riders] about the 19 circuits. It depends on their results!" The Mandalika track will be "just over 4.3km", with 19 corners. 50,000 grandstand seats are planned with a general admission of over 100,000. "We're very conscious that the size of the fanbase in Indonesia is extraordinary," Hughes said. "We are looking at one of the largest, if not the largest, crowd for a MotoGP race."